The West Side Highway, built in 1936, was hailed as an engineering marvel - an elevated highway along the western edge of Manhattan, that promised to eliminate north-south traffic jams and cut travel times up to two-thirds. The elevated highway was never propertly maintained by the city, however, and even by the 1950s was in a rapid decline. On December 16, 1973, a section of the expressway collapsed, and the highway was immediately closed down, and finally was torn down in 1987. It has since been replaced by the Joe DiMaggio Highway, a surface-level street named after the former Yankee great. I have one card of Richard Bleier, from 2008 Bowman Draft Picks & Prospects Gold. Playing career: Richard Bleier was the Rangers’ sixth-round pick in 2008, and slowly moved his way through the organization, finally reaching AAA in 2013. Overall in his career he his 53-54 with a 4.04 ERA. Where he is now: He pitched in AA and AAA for the Rangers in 2013, the Blue Jays in 2014, and the Nationals in 2015. He signed with the Yankees for 2016. Google Autocomplete results: He is fifth when you type Richard Ble, between Richard Blewitt Blackstone, an investment banker, and Richard Bledsoe, an artist. Another prominent Richard Bleier served in the Air Force during the Korean War. Coming up next: The next profile will be Bill Blount. I have three cards of Darren Blakely. This one is from 1999 Bowman International. 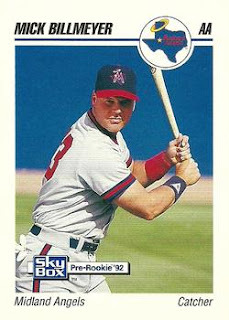 Playing career: Outfielder Darren Blakely played eight seasons in the Angels, Yankees, Padres and White Sox organizations. In 904 games he hit .247 with 115 HR and 456 RBI. 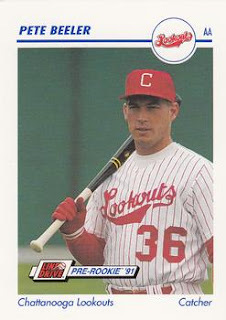 Where he is now: After his playing career ended he served in the United States Army as a Human Intelligence Collector including one tour in Afghanistan. Honorably discharged in 2014, he has started the Bucs Baseball Club in Tucson, AZ. Google Autocomplete results: He is seventh when you type Darren Blak, between Darren Blake Carmax Jamaica, referring to a defendant in a fraud case involving that company in the Caribbean country, and Darren Blakely Omaha, referring to the CEO of Vendorin. Another prominent Darren Blakely is a member of Acrylic Concepts in Las Vegas. Coming up next: The next profile will be Richard Bleier. I have one card of Tim Bittner, from 2004 SP Game Used Patch. Playing career: Tim Bittner pitched in the White Sox, Angels and Nationals organizations from 2001 to 2008. In 242 games he went 39-49 with a 4.21 ERA. Where he is now: A scout for the Astros. Google Autocomplete results: He is third when you type Tim Bit, between Tim Bitici, an art director, and Tim Bites, a snack at Tim Horton’s. Another prominent Tim Bittner is an administrator at the Children’s Institute in Pittsburgh. Coming up next: The next profile will be Darren Blakely. I have one card of Mick Billmeyer, from 1992 Skybox. Playing career: Catcher Mick Billmeyer played in the Orioles, Angels and Rangers organizations from 1985 to 1992. In 514 games he hit .247 with 22 HR and 183 RBI. Where he is now: Bullpen coach for the Detroit Tigers. Interesting stories: Before joining the Tigers in 2014 he was the Phillies’ bullpen coach for a decade. He made national news in 2010 when the Rockies observed him looking at the home plate area with binoculars during the first inning of a game and accused the Phillies of stealing signs. Billmeyer wasn’t stealing signs but the Phillies’ owner wouldn’t let Billmeyer explain to the media – according to Billmeyer “I think he liked the [Rockies’] paranoia”. It turns out Billmeyer (who is not married) was checking the stands to see if a lady friend whom he had bought tickets for had arrived. Google Autocomplete results: He is first when you type Mick Bi, ahead of Mike Birbiglia, a comedian. There do not appear to be any other prominent Mick Billmeyers. Coming up next: The next profile will be Tim Bittner. 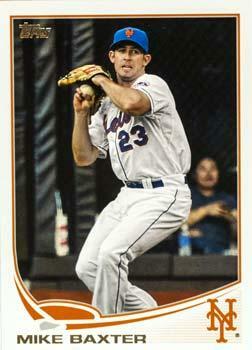 I have one card of Bruce Billings, from 2011 Bowman Draft Picks Chrome. Playing career: Bruce Billings has pitched nine seasons of professional baseball, making the major leagues with one game with the 2011 Rockies, three games for the 2011 A’s and one game for the 2014 Yankees, going 0-0 with a 9.82 ERA. Where he is now: Pitched at the Nationals’ AAA team at Syracuse in 2015, going 8-5 with a 3.63 ERA in 27 games. My memories: I didn’t remember him as a Yankee at all. He pitched four innings in a 13-1 loss to the Angels on a Friday night in April, so I’m sure I missed that one. Google Autocomplete results: He is third when you type Bruce Bil, between Bruce Bilger, a banker, and Bruce Billig, Director of the CUNY School of Education’s Office of Clinical Practice. Another prominent Bruce Billings is Associate Professor of Accounting at Florida State University. Coming up next: The next profile will be Mick Billmeyer. I have two cards of Michael Billek. This one is from 2005 Bowman Draft Picks. 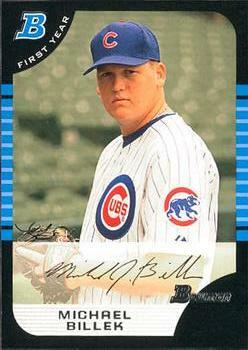 Playing career: Michael Billek pitched in the Cubs organization from 2005 to 2007. In 48 games he went 9-11 with a 6.14 ERA. Where he is now: He is a firefighter/paramedic for Tampa Fire Rescue. A third-generation firefighter (his grandfather was NYFD), he is on the board of the Captain Billek Foundation in memory of his father, who died of melanoma. Google Autocomplete results: There are no autocomplete results. Another prominent Michael Billek is a security manager at a nightclub in Maryland. Coming up next: The next profile will be Bruce Billings. I have three cards of Kennard Bibbs. This one is from 2005 Bowman. 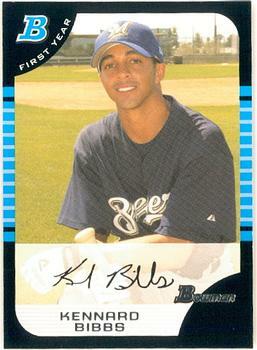 Playing career: Outfielder Kennard Bibbs played in the Brewers organization from 2002 to 2006. In 512 games he hit .273 with 4 HR, 139 RBI and 155 SB. Where he is now: Anyone know where Kennard Bibbs is now? Google Autocomplete results: He is first when you type Kennard Bi, ahead of Leonard Big Bang, referring to a character on a television show. There do not appear to be any other prominent Kennard Bibbses. Coming up next: The next profile will be Michael Billek. Thanks TJ and congrats again on Junior Junkie Junior! 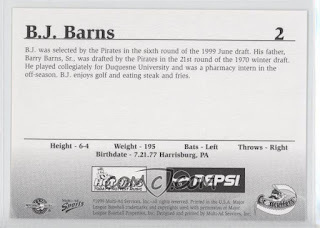 Outfielder BJ Barns played in the Pirates organization from 1999 to 2003. In 530 games he hit .251 with 39 HR and 249 RBI. Now pharmacist at Dartmouth-Hitchcock Medical Center in New Hampshire, he kindly answered my questions about baseball cards. 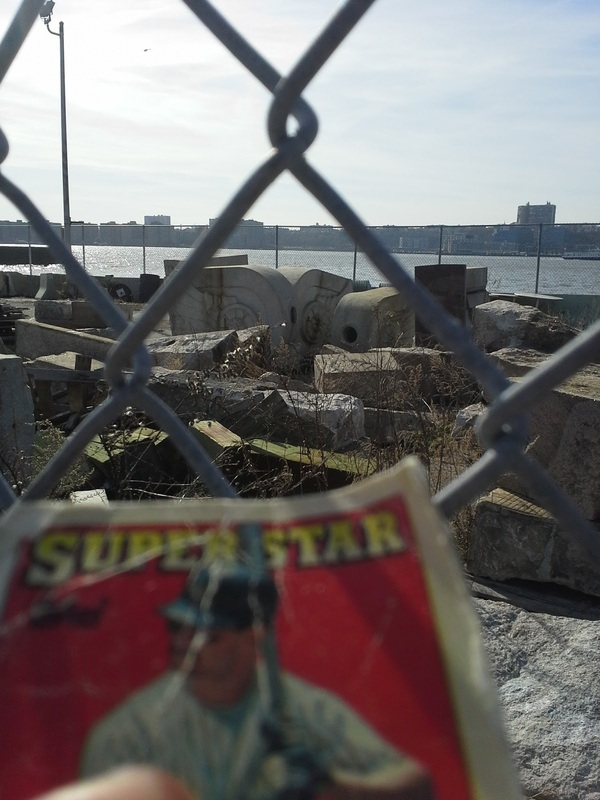 "My favorite card is probably the Bowman card because they made a few finishes to it. This is despite the fact that everybody looks at it and says "did you have mullet?" No, it's a shadow!! 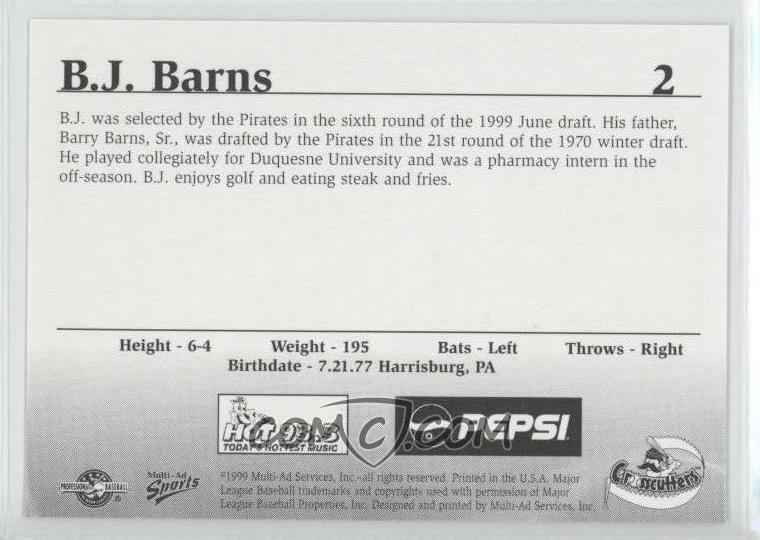 My wife things my Williamsport Crosscutters card from the team set is hilarious because it say my favorite food is steak and fries. 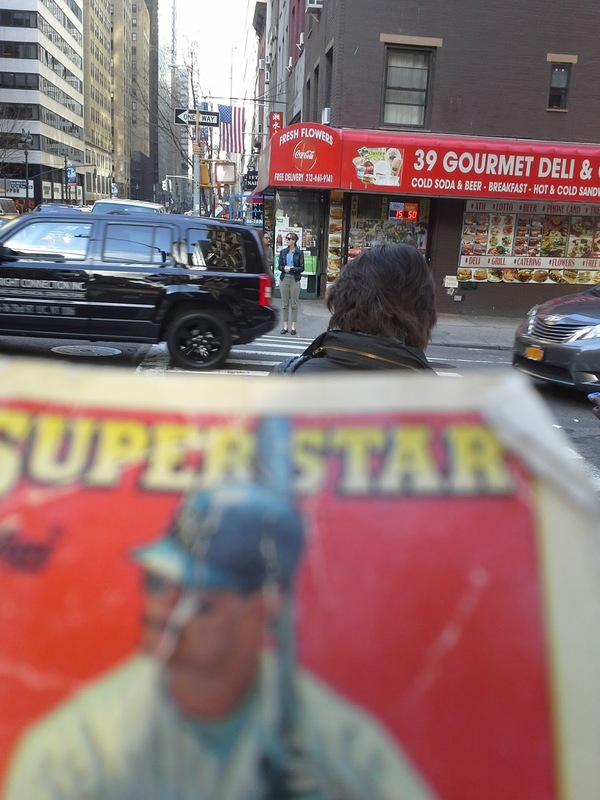 Who puts food preferences on the back of a baseball card anyway? I guess when it's your first year and there aren't any professional stats to fill in the void they do that. I don't collect them anymore but did until I got into high school. My dad started me with a 1987 Topps set (Bonds rookie card) and he gave me his old collection from the early sixties (he had 3 1961 Mantle cards plus a few other good ones). 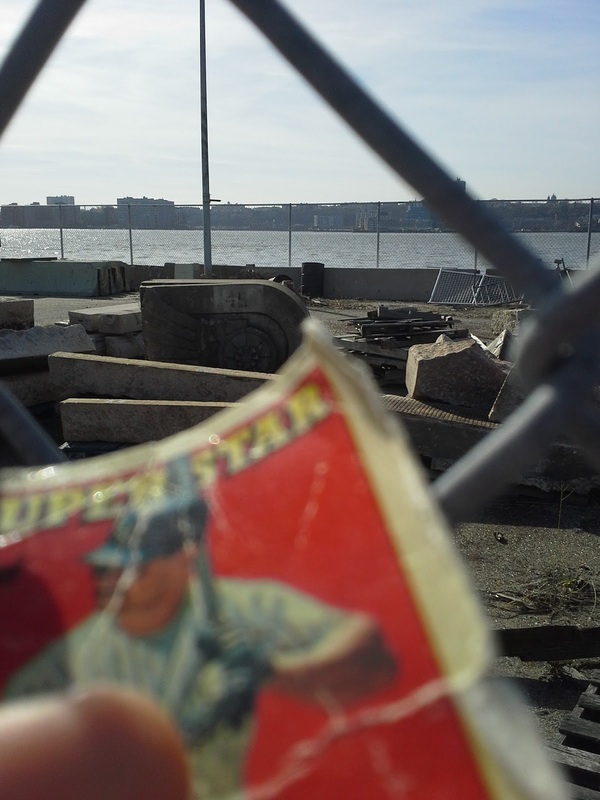 I bought the first Upper Deck set (with Griffey's rookie card), its MSRP value skyrocketed shortly afterward. For some unknown reason (probably to show it off or put it in a special case) I separated the Griffey card from the rest and now I can't find the damn thing." On January 8, 1877, NYPD Patrolman John McDowell was shot in the head foiling an attempted robbery at Courtney's Saloon at 315 7th Avenue. 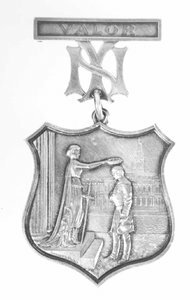 McDowell, who survived, was not the first NYPD officer to be shot in the line of duty, but was the first to be honored with this Tiffany-designed medallion. Thirty years later, Yankeees owner and former NYPD Commissioner Big Bill Devery used the medallion to be the basis of a new interlocking-NY logo for the ballclub, one that is still used to this day. 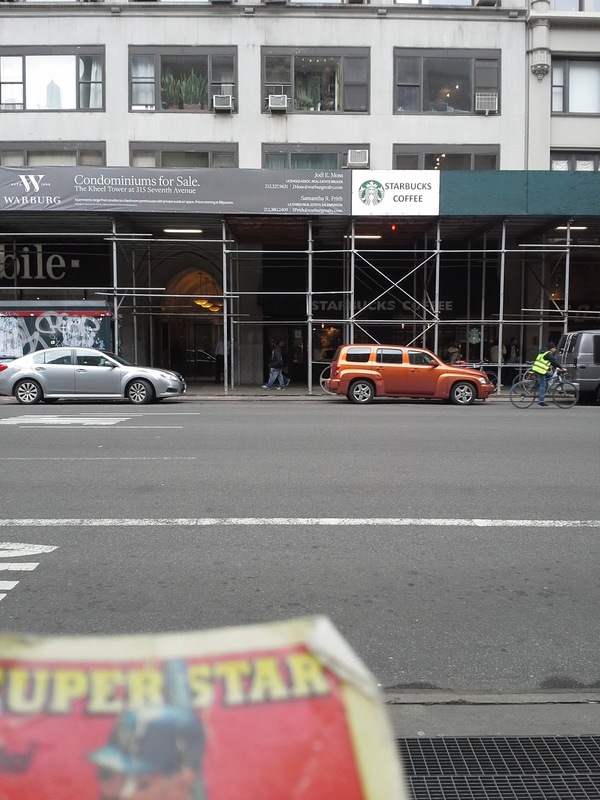 Here is Wallet Card at the site of the shooting, site of a 21-story apartment building since 1925. I have one card of Todd Betts, from 2001 Team Best. Playing career: Third baseman Todd Betts played eleven seasons in the Indians, Marlins, Mariners, Red Sox and Yankees organizations. 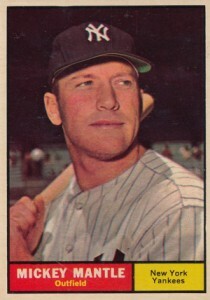 In 1,064 minor league games he hit .282 with 126 HR and 535 RBI. 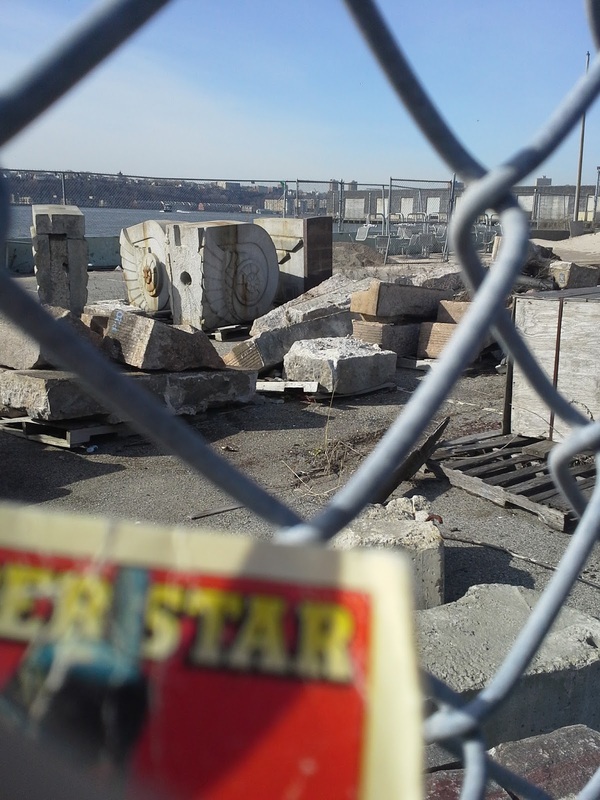 Where he is now: Owns 4 Corners Elite Baseball Development in Toronto. Google Autocomplete results: He is eighth when you type Todd Bet, between Todd Betke, a Partner at K&L Gates in Washington, and Todd Bertuzzi, a former Red Wings winger. Another prominent Todd Betts is an artist. Coming up next: The next profile will be Kennard Bibbs. 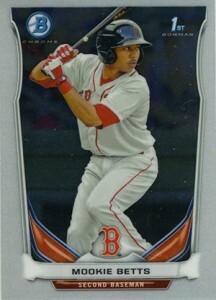 I have one card of Mookie Betts, from 2014 Bowman Chrome Prospects. Playing career: Outfielder Mookie Betts made his major league debut for the Red Sox in 2014. In 52 games he hit .291 with 5 HR and 18 RBI. Where he is now: He built on his rookie season with a very solid 2015, hitting .291 with 18 HR and 77 RBI in 145 games. My memories: I’m usually driving home from the train station around the top of the first of a 7:05 Yankee game. In their series in late September at Yankee Stadium Betts led off the first two games with a double and the third with a single. Interesting facts: Nephew of former major leaguer Terry Shumpert. Google Autocomplete results: He is first when you type Mook, ahead of Mook, a slang term for a stupid person. There do not appear to be any other prominent Mookie Bettses. Coming up next: The next profile will be Todd Betts. 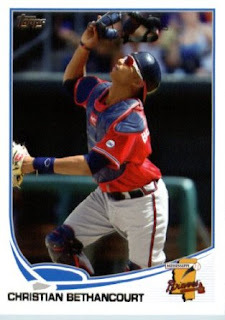 I have one card of Christian Bethancourt, from 2013 Topps Pro Debut. Playing career: Catcher Christian Bethancourt played for the Braves from 2013 to 2015. In 80 games he hit .219 with 2 HR and 21 RBI. Where he is now: In December he was traded to the Padres for Casey Kelly. Google Autocomplete results: He is first when you type Christian Bet, ahead of Christian Betheuil, a finance professional. There do not appear to be any other prominent Christian Bethancourts. Coming up next: The next profile will be Mookie Betts. 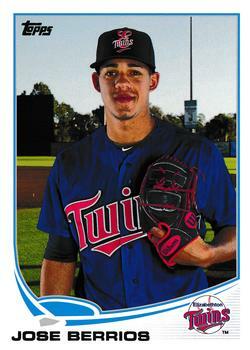 I have one card of Jose Berrios, from 2013 Topps Pro Debut. Playing career: Jose Berrios was the Twins’ first-round draft pick in 2012 and has moved quickly through the organization, going 36-20 with a 2.98 ERA in four minor league seasons. Where he is now: He had a sensational 2015, split between AA Chattanooga and AAA Rochester, going 14-5 with a 2.87 ERA. Google Autocomplete results: He is sixth when you type Jose B, between Jose Baston, fiancé of actress Eva Longoria, and Jose Baez, an attorney. There do not appear to be any other prominent Jose Berrioses. Coming up next: The next profile will be Christian Bethancourt. I have three cards of Roger Bernadina. This one is from 2011 Topps. Playing career: Outfielder Roger Bernadina played for the Nationals, Phillies, Reds and Dodgers from 2008 to 2014. In 548 games he hit .236 with 28 HR and 121 RBI. Where he is now: He spent 2015 with the Rockies’ AAA team in Albuquerque. In 119 games he hit .276 with 15 HR and 62 RBI. He is now in the Mets organization. Google Autocomplete results: He is fifth when you type Roger Ber, between Roger Berkowitz Bard, a political studies professor at the college, and Roger Ebert, the film critic. There do not appear to be any other prominent Roger Bernadinas. Coming up next: The next profile will be Jose Berrios. I have one card of Justin Berg, from 2008 Bowman Chrome Prospects. 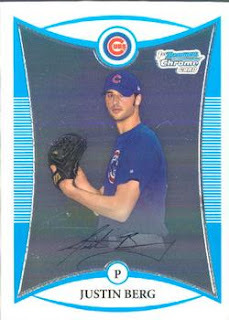 Playing career: Justin Berg pitched for the Cubs from 2009 to 2011. In 60 games he went 0-1 with a 4.08 ERA. Where he is now: Instructor at Premier Sports Academy in Weston, WI. Google Autocomplete results: He is third when you type Justin Berg, between Justin Bergman, a doctor in New Jersey, and Justin Berger Obituary, referring to the death of a Pennsylvania man. Another prominent Justin Berg is a professor at the Stanford Graduate School of Business. Coming up next: The next profile will be Roger Bernadina. 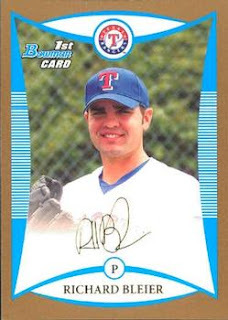 I have one card of Shane Benson, from 2007 Bowman Chrome Prospects. 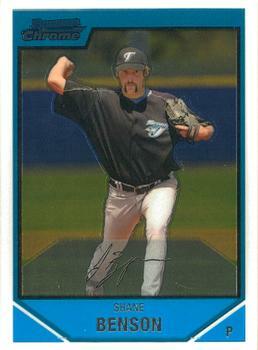 Playing career: Shane Benson pitched in the Blue Jays organization from 2005 to 2007. In 31 games he went 10-6 with a 4.93 ERA. Where he is now: Anyone know where Shane Benson is now? Google Autocomplete results: He is sixth when you type Shane Ben, between Shane Benedict, designer of LiquidLogic Kayaks, and Shane Bench, a post-doctoral psychology student at the University of Washington. The first entry when you google Shane Benson is not the ballplayer but the Managing Partner of New York Vintners. Coming up next: The next profile will be Justin Berg. 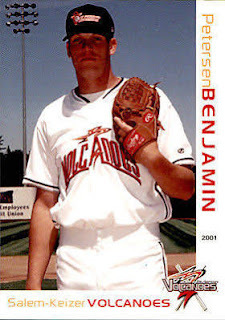 I have one card of Petersen Benjamin, from 2001 Pepsi Grandstand Salem-Keizer Volcanoes. Playing career: Petersen Benjamin pitched in the Giants organization in 2001 and 2002. In 29 games he went 5-9 with a 4.50 ERA. Where he is now: A civil engineer at Hazen & Sawyer in Atlanta. Google Autocomplete results: Petersen Benjamin does not appear in Google Autocomplete. The first entry when you google Petersen Benjamin is not the ballplayer but an intellectual property attorney at Shearman & Sterling named Benjamin Petersen. Coming up next: The next profile will be Shane Benson. Ray Bari Pizza was one of the many "Ray's" pizzas around New York City. (The true original Ray's is located on Prince Street, though several later pizzerias call themselves "Original Ray's.) Ray Bari's on 56th Street put up a huge sign to celebrate an anniversary (10th? 20th? 25?th) and last updated in 2003 to celebrate their 30th anniversary. There never was a 35th anniversary - the restaurant was closed by 2007. Nevertheless the sign remains, now looming over a different pizza place, Cassianos. 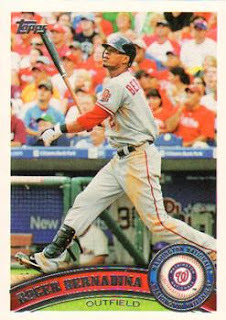 I have two cards of Engel Beltre. 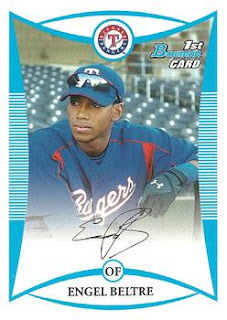 This one is from 2008 Bowman Prospects. Playing career: Outfielder Engel Beltre played in 22 games for the Rangers in 2013. In 40 at-bats he hit .250 with 0 HR and 2 RBI. Where he is now: He split 2015 between affiliates of the Giants and White Sox, hitting .247 with 6 HR and 33 RBI in 107 games. Google Autocomplete results: He is eighth when you type Engel , between Engel and Volkers NYC, a realty firm, and Engel Rammstein, referring to a song by the metal band. There do not appear to be any other prominent Engel Beltres. Coming up next: The next profile will be Petersen Benjamin. I have documented on this blog several privilege signs - remnants of the 1950s-1970s when every convenience store and luncheonette had signage paid for by a major soda company (usually Coke or Pepsi but occasionally others) in exchange for having their logo prominent on the sign. These are almost unheard of today which makes it feel like a throwback when I come across one. 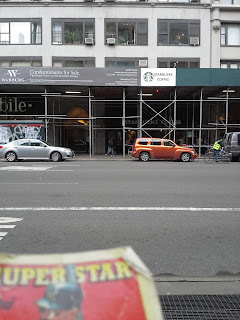 It's very unusual to see a new one but I found one here at this convenience store on Lexington Avenue and 39th Street. From photographs I could find online this sign was not up in the 1980s, but was up by 2007. I have one card of Cristian Beltre, from 2009 Bowman Prospects. Playing career: Cristian Beltre pitched in the Diamondbacks organization from 2007 to 2011. In 133 games he went 28-34 with a 4.98 ERA. Where he is now: Anyone know where Cristian Beltre is now? Google Autocomplete results: He is third when you type Cristian Belt, between Cristian Beltu, an oil professional, and Cristian Beltrame, Supply Chain Analyst at Guardian Industries in Brazil. There do not appear to be any other prominent Cristian Beltres. Coming up next: The next profile will be Engel Beltre. 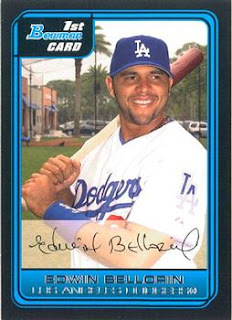 I have two cards of Edwin Bellorin. This one is from 2006 Bowman Prospects. Playing career: Catcher Edwin Bellorin played in eight games for the Rockies from 2007 to 2009. He had three hits in thirteen at bats. Where he is now: Coaching in Venezuela. Google Autocomplete results: He is third when you type Edwin Bel, between Edwin Bell, a court administrator in Georgia, and an architect in Ohio. There do not appear to be any other prominent Edwin Bellorins. Coming up next: The next profile will be Cristian Beltre. I have one card of Josh Bell, from 2013 Topps Pro Debut. Playing career: First baseman Josh Bell was the Pirates’ second round draft pick in 2011 and has moved quickly through their system. In four seasons he has hit .305 with 30 HR and 225 RBI. Where he is now: He had an excellent 2015 at AA Altoona and AAA Indianapolis, hitting .317 with 7 HR and 78 RBI. Google Autocomplete results: He is third when you type Josh Be, between Josh Beech, a singer, and Josh Bell Violinist, a musician. 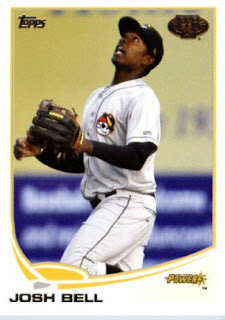 Another prominent Josh Bell played for the Orioles in 2010 and 2011. I have one card of Pete Beeler, from 1991 Line Drive. Playing career: Catcher Pete Beeler played nine seasons in the minor leagues, mostly in the Reds system. In 603 games he hit .236 with 38 HR and 224 RBI. Where he is now: Owner of Business Improvement Technologies, a security company in North Carolina. Google Autocomplete results: He is seventh when you type Pete Bee, between Peter Beeson, Co-Founder of Fit Insurance, and Pete Beecherl, VP of Engineering at Acument. Another prominent Pete Beeler is a graphic designer for the San Francisco Metropolitan Transportation Commission. The block of West 44th street between Fifth and Sixth Avenues contains some of the fanciest hotels in New York - the Algonquin, the Royalton, the Sofitel, the Iroquois. 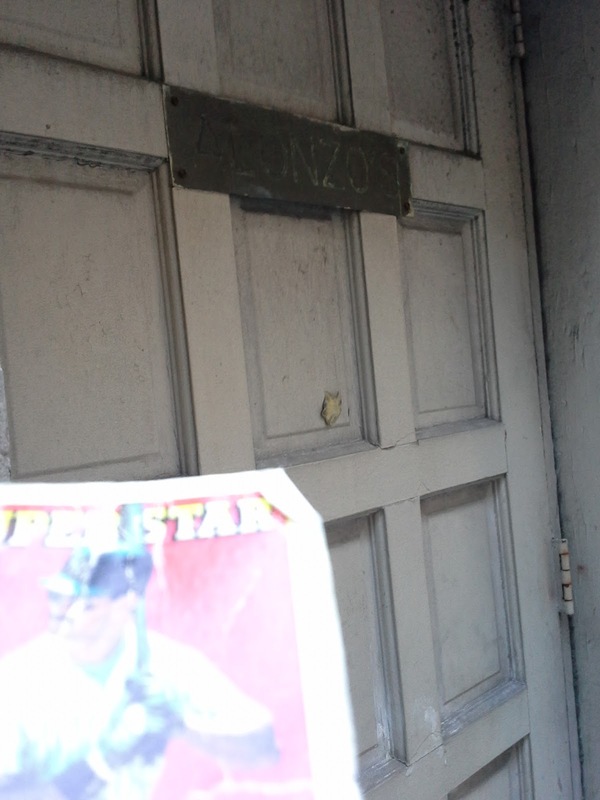 And yet nestled in between the Sofitel and the Iroquois is a small, abandoned building with the name Alonzo on the door. The building, originally stables, housed an actors club for several years, and by the 1960s was a Belgian crepe restaurant. In 1981 it became an Italian restaurant, Alonzo's, that closed sometime in the mid-1990s. In 2001 the property was bought by the Iroqouis with plans to expand it into a banquet and convention space. 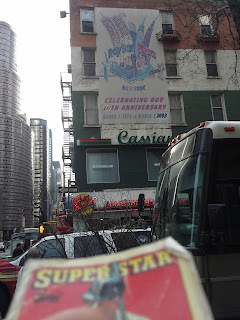 Somehow, fifteen years later, the renovations have not happened, and the building remains abandoned, with the faded sign of a restaurant that closed twenty years ago still gracing the door. I have two cards of Mike Baxter. This one is from 2013 Topps. Playing career: Outfielder Mike Baxter came up with the Padres in 2010 and has since played with the Mets, Dodgers and Cubs. In 232 games he has hit .228 with 4 HR and 28 RBI. Where he is now: He signed with the Seattle Mariners for 2016. Google Autocomplete results: He is eighth when you type Mike B, between Mike Breen Author, a religious writer, and Mike Bossy, the former Islanders star. Another prominent Mike Baxter is a partner at Bain & Co.
Coming up next: The next profile will be Pete Beeler. The organization New 42nd Street was behind the 1990s transformation of 42nd Street in Times Square from a seedy adult area that tourists stayed away from, to the very family- and tourist-friendly mall-like atmosphere it now has. Recently, to celebrate the transition, they have put up a nearly full-size panoramic photo of 42nd Street in 1987 that almost lets you feel like you've stepped 30 years back in time. 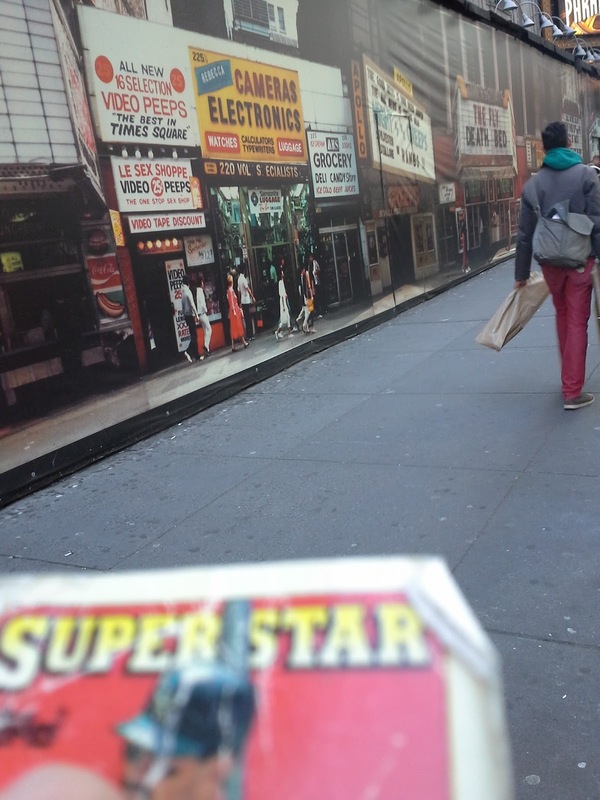 Here is a photo of the Wallet Card in front of what 42nd Street looked like when the card was first printed. 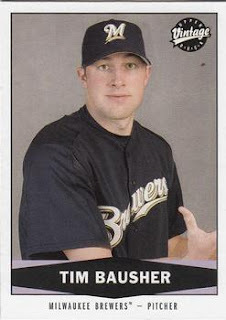 I have one card of Tim Bausher, from 2004 Upper Deck Vintage. Playing career: Tim Bausher pitched six seasons of minor league baseball – for six different organizations! (Mariners 2001; Brewers 2003-2004; Rockies 2004; Red Sox 2005-2006; Reds 2006; Royals 2007). In 153 games he went 14-29 with 10 saves and a 4.57 ERA. Where he is now: A coach at Lefty’s Sports Academy in Clifton, NJ. Google Autocomplete results: He is first when you type Tim Baus, ahead of Tim Bausch, a student at SUNY Fredonia. There do not appear to be any other prominent Tim Baushers. Coming up next: The next profile will be Mike Baxter. I have two cards of Cody Allen. This one is from 2015 Topps Heritage. 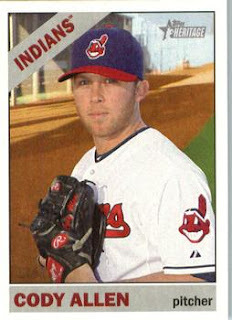 Playing career: Cody Allen came up with the Indians in 2012 and had two good seasons as a middle reliever. He was promoted to closer in 2014, saving 24 games that season and 34 in 2015. Where he is now: He is slated to be the Indians’ closer again this season. My memories: It’s a lot harder to follow every player on every team then it was when I was a kid or even young adult. Even ten years ago there is no way a guy who had 58 saves over two seasons would be completely unfamiliar to me, but I have no memory of Allen whatsoever. Google Autocomplete results: He is fourth when you type Cody A, between Codey Arena, a skating rink in New Jersey, and Cody and Zack, a TV show. Another prominent Cody Allen is a singer.